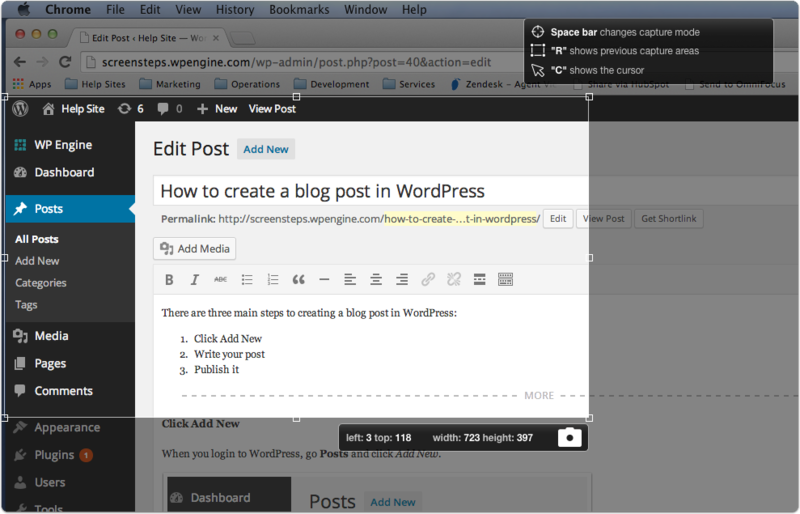 This article will show how to use the Capture button. Drag over the area you want to capture and then press return on your keyboard. The image will be captured. If you would like a bit of a delay before the screen capture session begins, you can change the capture delay setting. 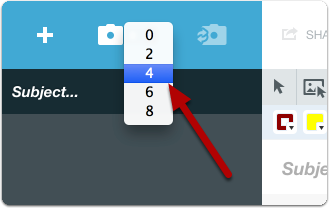 Click on the number to the right of the camera to specify the number of seconds that Clarify should wait before starting the capture session after you click the capture button. Changing the delay is helpful if you need to set up a screenshot. For example, if you want to capture a menu. Press the space bar to capture a full window instead of just a region. Press the spacebar again to go back to region capture mode. Press R to cycle through the previous regions you have captured. This can be handy when capturing the same area of the screen over and over again. Press C to show or hide the cursor in the capture. When I hit the hot keys the begin the capture session, my entire screen goes black. May someone please tell me what I am doing wrong? Is there a way to capture the mouse pointer? I'd like to be able to capture a hover effect. 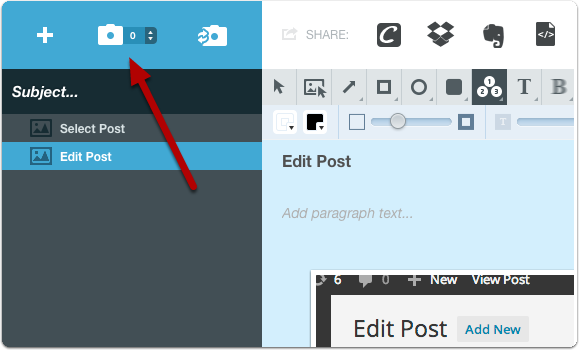 @Mark you can toggle the visibility of the cursor using the C key. There is a "tips" area during a screen capture session that shows other shortcut keys you can use as well. Is there a way to catalog images? If I add a image to multiple areas. When I update this image at a later date is there a way the system cataloged where this image was used and will update all areas this one image was used? @Connie No, there is not. Is there a way to capture the entire screen without using the crosshairs? @douglas - no, there is not. Is there a way to capture images from a second monitor in a multiple monitor environment? @james - Clarify should be able to capture a screenshot from all monitors attached to your computer. If not then send a support request to support@screensteps.com with a description of your environment and what is going wrong. Can Clarify-it capture a full screen with scrolling? i.e. if I want a full page that needs to be scrolled, can this be done automatically or will I need to take multiple screenshots? @Adam - Clarify cannot capture entire web pages. I believe there are browser extensions available that will do that. You could use a 3rd party tool and then paste the image into Clarify. How can I give Clarify access to use Photos in stead of only iPhoto om my Macbook? Must be a simple solution, but I can't find it..
@Rob - I'm not sure what you mean. Can you provide some more details? I have an issue where when I capture an image my screen gets cut off. Its like it doesn't like the graphics driver. @Sharif - Are you using two monitors on Windows? If so, Clarify will only work properly if both monitors have the same zoom setting. For example if one monitor has zoom set to 100% and the other is set to 150% then it will cause problems on one of the monitors. Hi Trevor, sorry for the late reply on my question of October 4th. When I want to select a photo, I only see iPhoto (old) on my MacBook and not Photo's (new). Hope you understand now what I mean! @Rob Please send an email to support@screensteps.com including a screenshot of what you are seeing, the version of Clarify that you are using, and the version of macOS that you are using.